It's perhaps only natural to harbor some reservations when a big corporation takes over a smaller startup, as with Microsoft's recent $250m purchase of SwiftKey. Creator of the cross-platform keyboard of the same name, SwiftKey has accumulated some 300 million users since emerging in beta back in 2010. With a bunch of useful AI technology working its magic beneath the slick, multi-themed interfaces, it was only a matter of time before one of the major players stepped in with a fistful of cash. Microsoft today confirmed that a deal has been done, while SwiftKey has sought to put minds at rest about the future of its immensely popular keyboard app. SwiftKey, as some may remember during its Android-only beginnings, used to be a paid app. Having gratefully broadened its horizons to iOS after Apple opened up the keyboard element of its mobile software to third parties, it's now a freebie, with many in-app themes helping to generate revenue. The algorithms and under-hood tech may have provided the nectar that has seen Redmond open its checkbook, but most users care about the app itself. Thankfully, the app for iOS and Android will stay completely free, while Microsoft will look for ways to integrate its newly-acquired technology into the pre-existing Word Flow tech for Windows. Microsoft is clearly throwing a lot of weight behind artificial intelligence, as was demonstrated with the promising HoloLens at E3 last year. We got a chance to try the product out briefly, and felt like kids at a candy store. While HoloLens isn't ready to take on the world just yet, there's no question that it's going to be central to Microsoft's AI endeavors. SwiftKey is doubtlessly a major coup for the Windows maker, but don't expect it to be the last as Silicon Valley scrambles towards a future dominated by AI. I'm not sure anyone was panicking PA. They should be though. The app will remain free but MS will fire half the developers, gut the IP and the rest of the company and then declare they want to take a different direction. I can't say Google is much better with what they did to moto.. Maybe dial down your hate for Microsoft a bit? He didn't say anything about Google, why bring it up? No thanks. MS has a way of imposing their will on their purchases that usually ruins them. I'll say it goes it is, I'm not in danger of hurting their feelings. 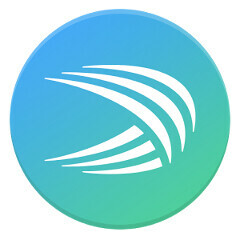 I love Swiftkey but I can't understand how it could be worth $250 million.